Sydney is known for nightlife, trails, beaches, parks, and museums. 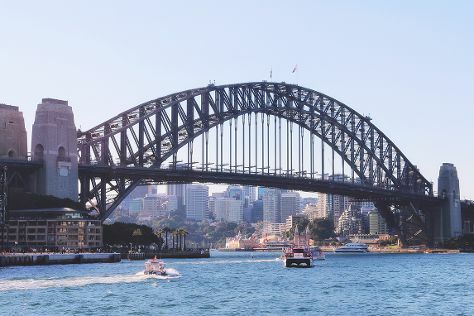 Your plan includes some of its best attractions: admire the natural beauty at Royal Botanic Garden Sydney, appreciate the extensive heritage of The Rocks, don't miss a visit to Sydney Harbour Bridge, and see a show at Sydney Opera House. Singapore, Singapore to Sydney is an approximately 10.5-hour flight. You'll lose 2 hours traveling from Singapore to Sydney due to the time zone difference. In June, Sydney is cooler than Singapore - with highs of 21°C and lows of 11°C. Cap off your sightseeing on the 2nd (Tue) early enough to travel to Melbourne. Melbourne is known for museums, shopping, parks, zoos & aquariums, and nightlife. Your plan includes some of its best attractions: admire the natural beauty at Royal Botanic Gardens, learn about all things military at Shrine of Remembrance, tour the pleasant surroundings at Melbourne Zoo, and explore the world behind art at National Gallery of Victoria. To see reviews, traveler tips, and tourist information, go to the Melbourne vacation planner. You can fly from Sydney to Melbourne in 3.5 hours. Alternatively, you can do a combination of flight and shuttle; or drive. Prepare for little chillier weather when traveling from Sydney in July: high temperatures in Melbourne hover around 15°C and lows are around 6°C. On the 7th (Sun), wrap the sightseeing up by early afternoon so you can travel back home.